Create Your Profile Over The Telephone Or Online - It Will Be stored Privately And Will Not Be Posted Online Or Publicly Anywhere. Only Our Female Matchmakers Have Access To Profiles. Simply State Exactly What You're Looking For - Eg Age Range, Ethnicities, Marital Status, Education Levels, Height & More. We Have Clients From All Backgrounds, From Professionals To Business Owners To Celebrities. Your Dedicated MatchMaker Will Search Through Our Private Database To Handpick Matches Based On Your Profile And Requirements. Your Match Information Will Be Sent To You Via Messaging. If You Are Happy With Your Match Then Take Things Forward With Them! If Things Don't Work Out, Simply Let Your Matchmaker Know And You Will Be Booked In For Another Match. Provide Some Feedback As This Information Will Be Used To Tailor Future Matches. All Our Profiles Are Vetted & Verified For Your Peace Of Mind (192 People & Social Media Checks). Thousands Of Trusted British Muslim Singles In The UK Looking For Marriage. Transparent - One payment and no additional fees. We get asked this all the time, so here is a breakdown! Our clients range from 20 to 75 years of age, 20s, 30s, 40s, 50s being incredibly popular. We have professionals, non-professionals, business owners, entrepreneurs, celebrities, doctors, barristers, chartered accountants, pharmacists, (just about every profession under the sun!). We have clients who have never been married, divorcees, single parents. Pakistani, Indian, Bengali, Arab, Caucasian, Afro-Carribean, mixed race, reverts and more. We have clients who are really religious, and clients who aren't religious, and clients in-between. We have clients who are cultured and clients who are not cultured. Clients who handle their profiles themselves, and clients whose family handle their profiles. What we are trying to say, is that we have someone for everyone! Simply state what it is you are looking for when registering. All of our UK clients are British, we have clients outside of the UK, e.g. 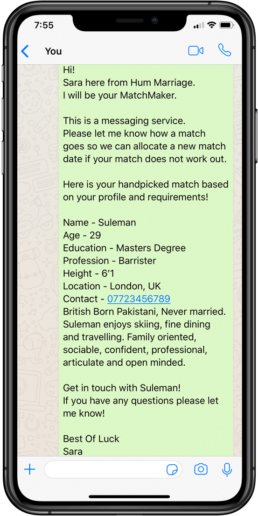 in the US, Canada, Europe, Pakistan, India and more, however the UK is our largest database at well over 9000 serious British single muslims looking for marriage. Yes we can help if you are living abroad, but we will not simply find you someone living in the UK if you are living abroad - you must accept matches from your home country also. Hum Marriage is a Muslim marriage bureau designed to match single Muslims in the UK with like-minded individuals. We specialise in matching muslim singles from across the UK from all backgrounds. We have thousands of single muslims looking for marriage within the UK, our most popular cities being London, Birmingham and Manchester. Of course we have thousands of Muslims looking for marriage in other locations within the UK too. Hum Marriage are the UK’s Professional Muslim Matchmakers, offering a Dedicated Matchmaker with all our packages. Your Muslim Matchmaker will handpick suitable singles for you based on your requirements and overall profile. 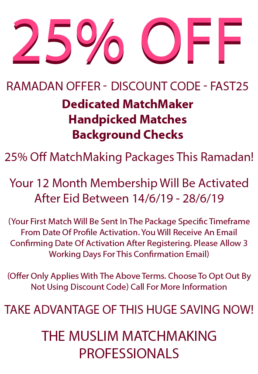 Our matchmaking experience makes us one of the most successful Muslim marriage sites in the world.Hum Marriage offers a 100% Money Back Guarantee for your peace of mind, assuring you we will either help find you a suitable Muslim for marriage, or refund you in full. (See our terms and conditions for more info). We are a fair Muslim marriage bureau and want happy customers! We currently have a 97% happy customer rate (See some reviews here)Our Muslim marriage site is one of a kind. We match based on your personality, age, height, education, caste, origin, location and much more! Rest assured we have the right single Muslim for you!We have grown to become the UK’s largest Muslim marriage bureau with an incredible success rate due to our diligent and thorough matchmaking and large database of Muslim singles. Our Muslim marriage site offers a tailored and bespoke Muslim matchmaking service with a 5-Star customer service rating. If you are a Muslim looking for a professional and personalised Muslim marriage site, look no further. For Muslim matchmaking at it’s finest, privacy assured, and guaranteed matches, give us a call and take control of your future now. We will assist you, as we have done with thousands of our single Muslim clients in finding a Muslim partner for marriage.